John Carroll Flinn was born in Bolivar, Tennessee in the summer of 1835. The winds of the Texas Revolution for Independence were blowing and Davy Crocket was said to have stopped in Bolivar and gave a Farwell speech to the citizens of Tennessee on his way to Texas. He would die at the Alamo the following spring. Bolivar was a rough and ready frontier town in 1830 Settlers were moving in each day, buying, giving their note to cover the mortgage on the merchandise in their establishment or stock on their farm and seeing it foreclosed without mercy or redtape within a year or so, then moving on to Mississippi, to Arkansas, or to Texas. Those were the days when many a man was ruined by going on the bond of his neighbor or friend. And in 1830 Bolivar, Tennessee, the man who handled those mortgages, notes and foreclosures was John's father, Isiah Flinn. Isiah was a gentleman and a scholar who was probably more familiar with ancient Greek and Latin than most of us are with our own language. Isiah, was reported to be a breeder of fine horses, and accumulated quite a bit of cash during his lifetime. This was rather unusual for that day and age in the Western District of Tennessee. Money was very scarce, and few people had any of it in their pockets or in the banks. The pioneers took their cotton, pelts, beeswax, etc. to the stores, and the merchants accepted them in exchange for the staples, medicine and clothing that were needed. Thus it was that people could live without the possession of or circulation of much currency. John's Mother was from a prosperous family in the area north of Bolivar on the Hardeman and Madison County line. Her father was John C. Teague and evidence suggest he made his home south of the small town of Medon, TN. There was a small settlement named Teague that was halfway between Bolivar and Medon but I'm not sure who it was named after. Seems I recall reading that it was named after one of John C Teague's sons. The Flinn's owned lots in Bolivar and probably made thier home there. The Flinn family prospered and with John Carroll being the oldest, the family saw 3 other siblings added to the fold. Then when John was 8 years old, tragedy struck. His father Isiah died. We do not know the reason, but medicine and drugs were not what they are today and early settlers were subject to many and varied diseases and plagues. Isiah was buried in the Clover Creek Cemetery, the same Church property being donated by John's Grandfather, John Teague. The Clover Creek Cemetery is just south of Medon, TN. Rhoda's love for Isiah was eternal as she never remarried. Rhoda family took her and the children in after Isiah's death as reflected in the 1850 census records. She and the children received some monies from the disposition of Isiah estate and other properties were retained. Rhoda took up residence with her father, John. John Carroll had 6 Uncles and 2 Aunts on his mother's side of the family. John's grandfather was a farmer and Miller. Surely John did chores on the Teague family farm and was but 7 years younger than his Uncle Joshua Teague who would have been 15. John was said to have had a clubfoot and may have began to look for a trade that was less physical as he grew older. He eventually learned the trade of saddle maker, possible from one of his Uncles in Medon, TN. It may have been that John often missed his dad and wondered if medicine had been more progressive, if his father might have lived. Such are the thoughts of children who lose a parent. These thoughts may have motivated his decision to take up medicine as a practice. With the blessings of his family and with the monies he had saved over the years, he set off to attend the University of Nashville. (Now Vanderbilt). Thomas Flinn has an admission pass for John C. Flinn when he attend Demonstrative Lectures on Anatomy for the Session of 1855 to 1856. Sometime after marrying Susan, the Flinns moved to Lexington, Tenn. where John began his medical practice. John and Susan had thier first child Mary Jane in 9 months and a day from thier marriage date on May 14, 1857. Thier home was not far from the battle at Parkers Crossing (Red Mound) to the north of Lexington and the battlefield at Shiloh which was a short distance to the south east of Lexington. John never joined the regular army but attended to the wounded at these battles. The Flinn's did thier part to support the war effort and there is an extensive story on that subject. The reconstruction years after the war were tough on all Southerners. 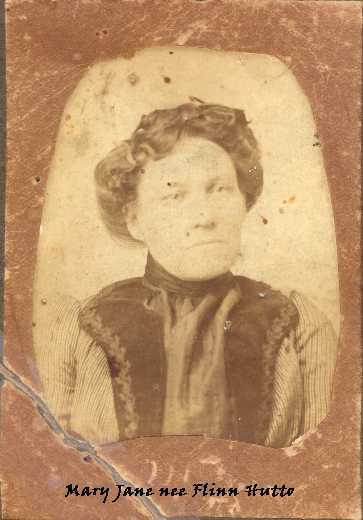 These circumstances and the letters from Susan's sister Mary who had moved with thier Aunt Mattie Blair to Texas 15 years earlier prompted the family to join many others in moving to Texas. One story has it that young Sally Bet Flinn was being led away by a stranger while crossing a river on thier trip at a ferry. Another story is told that the baby, Joseph Flinn cried all the way to Texas, probably because he wanted to be born in Texas. Leaving Tenn about the middle of November 1869 the family arriving in Round Rock on New Years day 1870. According to young Hal Flinn, John was offered 200 acres adjoining the then city of Dallas if he would stay and practice medicine there. Susan wanted to go on to Round Rock where she could be near her Aunt Mattie Blair, her father James McGuire's sister and her own sister Mary. John eventually settled on a farm near Shiloh Crossing on Brushy Creek Southeast of where the Town of Hutto would eventually be established. Susan assisted John when she could as nurse and midwife. John frequently made house calls to care for the sick on horseback. Susan would ride with him as well when she could. Other stories told tell of Susan putting her young children up on the horse with her to make calls with John. Both were well thought of in the community of Hutto and participated in community activities. They raised thier children in the church and were members of the local Masonic order. John practiced medicine in and about Hutto until he died in 1895. Susan nor John ever returned to Tennessee although Susan had at one time planned to do so. Susan continued to support her children and community for another 21 years before she joined John. John Flinn left a legacy of having raised 14 children to adulthood. many of his descendants went own to become doctors, lawyers and proud farmers of the earth. His descendants are numerous and are a proud monument to a great family that has strived to make thier forefathers name honored. One of the family stories tells of three brothers, William, Jasper and Isiah O'Flinn, whocame from Northern Ireland prior to 1800. Isiah's son, Isiah, born in Tennessee in 1805, changed the name to Flinn. He had five children, William Henry, Sarah Angeline, David Franklin, Elizabeth Jane and John Carroll. John Carroll Flinn was reported born in Henderson County, Tennessee, in 1829, the son of Isiah Flinn, born in Henderson County, Tennessee, 1805, and Rhoda Teague, born in Mechlenburg, North Carolina. John Carroll Flinn graduated from Vanderbilt University, practiced medicine in Tennessee, and attended the wounded at the Battle of Shiloh. ( He was crippled and was not in active military service.) Other family information states that John was born in Hardeman County Tenn. while his dad may have been born in Bedford, Tenn.
Mary Jane, (Jenny) as she was affectionately called and her husband C.W, Charles Wesley Hutto, whose father founded the town of Hutto, had 5 children and raised 4 children to adulthood in Hutto before moving to Kelso Washington abt. 1903. Family members speculated that they moved to Washington during the logging boom. The family bought a city lot in Kelso and continued to live there until this present day with the exception of one son, Hardie Hutto, who moved back to Taft, Texas. His Flinn Uncles helped him get started in the farming business. C.W.s body was returned to Hutto for burial in 1919 on his death, but Mary Jane was buried in Kelso Washington. The 1880 Census records for Williamson County, Texas, where Hutto Texas is located, identify John as a Practicing Physician. (Williamson County is East of Travis County where Austin Texas is located) As to if they traveled directly to Texas is unknown but it seems likely. They probably travel by covered wagon which was the mode of transportation in that day although it is possible they came by train. The three older children, Mary, John, and Curtis were not in the house at the time of the 1880 Census. John lived in and about the Hutto, Texas area with his wife, Susan who assisted him in his medical practice. She was identified as a house wife at the time of the 1880 Census. Other stories told tell of Susan putting her young children up on the horse with her to make calls with John. Hutto Old Timers Remember "When"
The first stores in Williamson county were owned by Josish (SP) Taylor of Shiloh on the Brushy in 1848 just three miles south east of Hutto, and by Neison Morey (Morey) , whose store was on the north side of Brushy. Hutto was not established until many years later but the little store was a nucleus first at Shiloh and later at Rices Crossing; for a community and the of Hutto's first citizens came from that area. The railroad came through Hutto in 1876, and during the 1880's a small community began to appear. 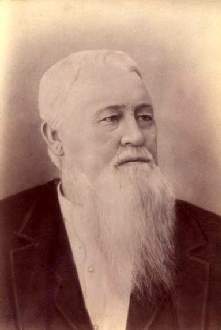 In 1855, J. E. Hutto came to Williamson county where he engaged in cattle raising. He became one of the wealthy cattlemen of the county, residing in the Hutto community until 1885, when he moved to Waco and entered the hardware business. It was for Mr. Hutto that the town was named, and a number of his children remained in the community, some of his descendants still living there. The children of J. E. Hutto were, J.H, J.E., W.T., C.W., H.E., R.B., Mrs. J. Sam Monday (Minetara Ellen Hutto), and Mrs. John A. Blanton (Nettie Hutto ). R.B. Hutto was born in 1857 and who up on his fathers ranch assisting his father until he reached maturity, when he with into the cattle business for himself. He later put land into cultivation to become interested in cotton forming. R.B.s children, according to biographical sketches in 1993 were Willis, Jennie, and May. The late Ben Hutto had the following children: Mrs. Sid Miller of Hutto, Mrs. Henry Kyle of Hutto, Bennie Hutto, who have a store their: Ladys daughter, and Price, another sort, Willis, another son, is deceased in his wife lives in Austin. In 1854, William T. Evans arrived, pitching his tent nerve on a farm on Brushy Creek on Christmas day of that year. For many years he was engaged in cattle dealings and drove stock to Kansas,New Orleans and other points. For 4 years during the Civil War he drove for the Confederate army. The Flinns had a son Dr. J. Flinn who also practiced the later . Doctors there in the 90s included Dr. Percy , Harper , Bowitn, How__, and Mc Cowan, and a Dentist named George Bruce.